A last-gasp goal from Fabian Kwok salvaged a 1-1 draw for Hougang United FC against Geylang International FC on Saturday evening as the Cheetahs finished bottom in the 2018 Great Eastern –Hyundai Singapore Premier League (SPL) season without winning a single home game. It looked like Cameron Aryton Bell had done enough to earn all three points for the visiting Eagles when he put his side up on 82 minutes at Hougang Stadium, but Kwok had other ideas as he nodded home in injury time. It was a familiar script for Hougang as they dominated the game in the first half, but were somehow unable to put their chances away. Shahfiq Ghani saw his 30-yard free kick repelled by the legs of Zainol Gulam on 11 minutes, before Antoine Viterale’s attempted lob was thwarted by the Geylang custodian eight minutes later. Stanely Ng then fired into the side netting from two yards out on 25 minutes, before Captain Nurhilmi Jasni somehow volleyed wide from just in front of goal three minutes. Geylang created their fair share of opportunities as well and came close to scoring six minutes into the second half, but Bell’s instinctive volley from just inside the area was well held by Hougang goalkeeper Zulfairuuz Rudy. Meanwhile, Hougang continued to be kept at bay by the alert Zainol, who is one of the nominees for the SPL Team of the Year. The 26-year-old held a goal-bound Shahfiq free-kick from 20 yards out on 64 minutes, before producing a stunning save to deny substitute Fazrul Nawaz’s header from point blank range seven minutes later. They were made to pay for their profligacy as Geylang broke the deadlock eight minutes from time. Darren Teh was allowed the luxury of space on the right to whip in a low cross into the area, where Bell reacted the quickest to prod the ball past Zulfairuuz. 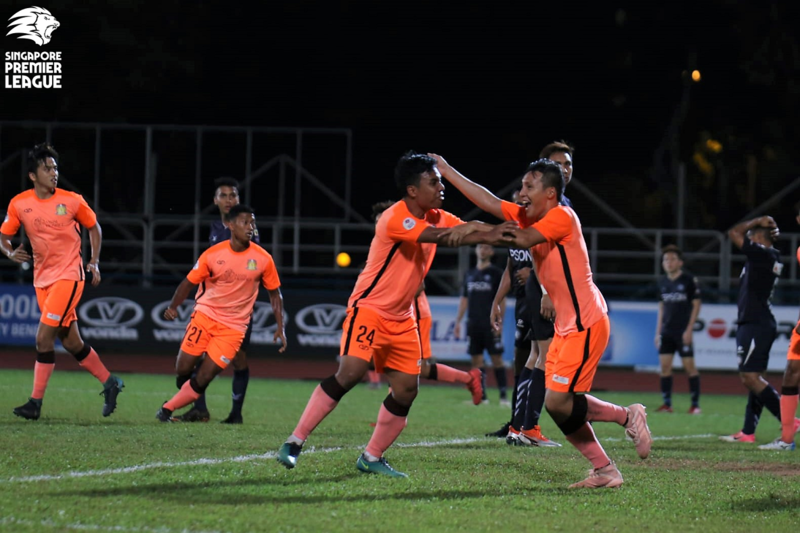 However, Hougang would steal a point at the death two minutes into injury time when substitute Fareez Farhan whipped in a superb free-kick into the six-yard box for Kwok to head in at the far post. The final whistle soon sounded to signal a disappointing end to the season for both sides, who find themselves propping up the league. Hougang Caretaker Head Coach Clement Teo: “Of course I’m not happy and it’s disheartening… We did not win at home all season and we owed this to our fans. It was the same thing (like most games this season) – we create, we don’t score and the opponents score first. Geylang Head Coach Hirotaka Usui: “We lost four points from two games. We also conceded a last-minute goal (to draw 2-2) against Young Lions last week. We have a lot of young players and they need to learn from these mistakes. “The players did improve from February – now we can control the game and build up tactically. I don’t want to throw (away) my responsibility, but our players have no basic skill. Things must improve but they are already 25 or 30 years old. So I want FAS (Football Association of Singapore) to spend money on youth academies. We must start from Under-12 to Under-14 for Singapore football to go up. Hougang: Zulfairuuz Rudy (GK), Nazrul Nazari, Illyas Lee, Fabian Kwok, Jordan Vestering, Justin Hui (Syukri Bashir 87’), Shahfiq Ghani, Antoine Viterale (Fareez Farhan 69’), Stanely Ng, Nurhilmi Jasni (C), Chang Jo-yoon (Fazrul Nawaz 69’). Unused subs: Khairulhin Khalid (GK), Syahiran Miswan, Amir Zalani, Syaqir Sulaiman. Geylang: Zainol Gulam (GK), Darren Teh, Jufri Taha (C), Afiq Yunos, Zulfadli Zainal Abidin, Yuki Ichikawa, Fumiya Kogure, Ryan Syaffiq (Azhar Sairudin 59’), Fairoz Hasan (Danish Irfan 88’), Yeo Hai Ngee (Umar Akhbar Ramle 80’), Cameron Ayrton Bell.